I have been impressed with Richa Hingle’s work for years! She runs an extremely popular blog called VeganRicha.com, and is known for her fantastic food photography and delicious recipes. In her recently published book Vegan Richa’s Indian Kitchen, Richa showcases her talents better than ever. She photographed nearly the entire book by herself, developed the mouth-watering recipes, and put together a great guide to stocking your pantry for Indian cooking. Her dishes are flavorful, packed with lots of plants, and inexpensive to make — I made the two recipes below for only $11, including bulk spices! You can learn more about Richa in our interview below, and make sure to check out her new book on Amazon. Before this book, I had never tried cooking Indian food. As I mentioned in my interview question below, I was really confused when I figured out that none of Richa’s recipes use curry powder. The whole cloves and cumin seeds, mixed with the garam masala and other spices were infinitely better, though! 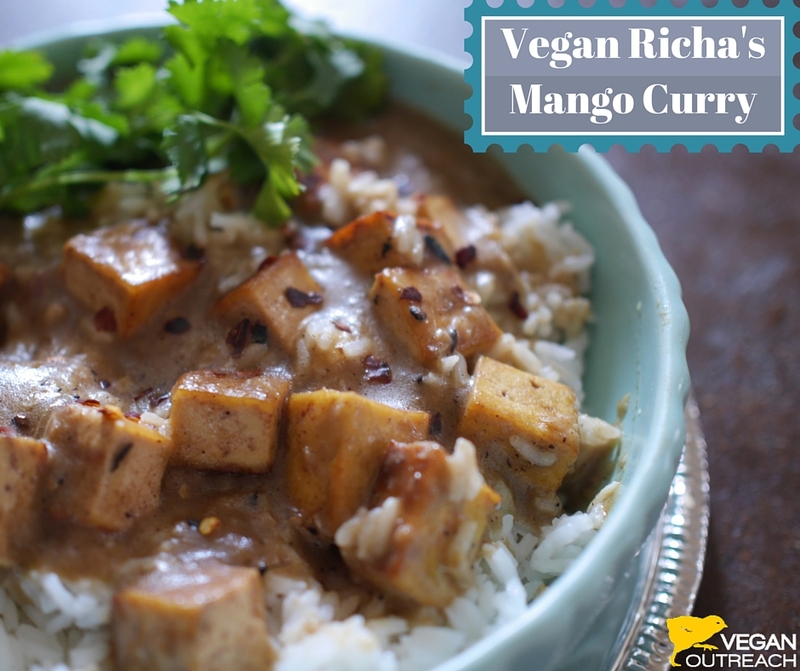 I realized that I had gone to the store and purchased everything I needed for the mango curry — EXCEPT the mango! Fortunately I had a bag of frozen mangoes, threw that in my Vitamix and it worked out just fine. The recipe was delicious served over rice. Tofu: Cut the tofu slab in 1/2-inch slices. Place them on a clean kitchen towel. Cover with another kitchen towel. Place 10-lb (approximate) weight on top and let sit for 10 minutes. Alternatively, you can use pressed tofu. Cut the tofu into 1/2-inch cubes. Heat the oil in a large skillet over medium heat. When the oil is hot, tilt the skillet so the oil coats it evenly. Add the tofu and cook until lightly brown on some sides, stirring occasionally, 4 minutes. Add the cayenne, cinnamon, garam masala, and salt and mix well to coat. Curry: In a blender, combine the onion ginger, and garlic, and blend into a smooth puree with 2 tablespoons of water. Heat the oil in a large skillet over medium heat. When the oil is hot, add the cumin seeds, bay leaves, and cloves. Cook for 1 minute. Add the pureed onion and cook until the onion mixture is dry and does not smell raw. Stir occasionally to avoid sticking, 13 to 15 minutes. Add the coconut milk, mango pulp, salt, and vinegar and mix well. Add the tofu and all the spices from the tofu skillet to the sauce skillet. Add a dash of black pepper. Mix, cover and cook until the sauce comes to a boil, 5 minutes. Reduce the heat to low and cook uncovered until the sauce thickens and desired consistency is achieved, about 15 minutes. Taste and adjust the salt and tang. Add 1/2 teaspoon or more sugar if the mango pulp was not sweet. Garnish with cilantro and a dash of garam masala and serve hot. Soy-free variation: Replace the tofu with 2 cups cooked chickpeas, 2 1/2 to 3 cups chopped vegetables, or 8 ounces hemp seed tofu. I sometimes get intimidated when I look at recipes with long lists of ingredients, but neither of these recipes were too bad. A lot of the list consisted of spices, and each of the recipes were easy to follow. The Chana Masala was excellent! It’s on her list of recipes to try if you’re a novice in Indian cooking, and it also happens to be a dish that I am very familiar with. Meaning, I knew what it should taste like, in case I was messing things up. I highly recommend it! In a blender, combine 1/2 cup cooked chickpeas, tomatoes, ginger, garlic, chile, and lemon juice and blend until smooth. Set aside. Add the pureed tomato-chickpea mixture. Cook partially covered for 15 minutes, stirring once about half-way through Deglaze with a little water if needed. Reduce the heat to medium-low and continue to cook until the mixture is dry and starts to leave the side of the pan, 10 to 15 minutes. The tomatoes and spice will start to smell roasted. Add the cooked chickpeas, salt, and sugar, and mix well. Add 2 1/2 cups of water. Cover, and cook for 30 to 40 minutes over medium-low heat. Taste, and adjust salt and spice at 30 minutes. 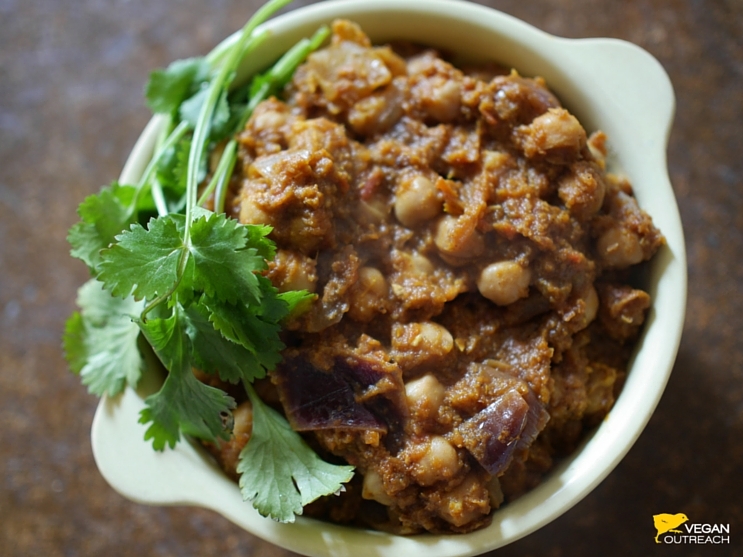 Continue to cook until the chickpeas are very tender and easily mashed, or until desired consistency is achieved. Mash some of the chickpeas. Garnish with cilantro, minced onion, and lemon juice, and serve hot. Pressure Cooker: Follow steps 1 through 4. Add the cooked chickpeas, salt, sugar, and 1 1/2 cups of water. Close and lock the lid, and cook for 10 minutes after the cooker reaches pressure (2 to 3 whistles). If using dry chickpeas that have been soaked overnight, add 2 1/2 cups water, salt, and sugar. Close and lock the lid, and cook for 20-25 minutes after the cooker reaches pressure (4-5 whistles). Garnish with cilantro, red onion, and lemon juice, and serve hot. Variation: Add 1 to 2 cups chopped spinach or other greens at step 4. After reading through Richa’s book and learning a bit about her background, I thought it’d be cool to add a short interview with my review. When did you start VeganRicha.com? Was it popular from the start? I started blogging about 5 years ago. It wasn’t popular immediately. After about 2 years of posting recipes, working on my photography and the kind of recipes, readers started making the recipes and visiting more often. With the help of social media and consistent posts, the blog started getting popular. Was it easy to go from blogger to published author? Was that always your mission? Once the blog got popular, my readers often asked for a print cookbook. I was approached by publishers, and I decided it was a good time to work on a book. I had not planned for a book when I started blogging. How long did it take you to create such a beautiful book? Is there something specific in the book that you are especially proud of? It took me one year with the recipe development, recipe testing, photography, photography editing, book editing, etc. I am proud of the whole book really, it is a result of lots of dedicated work which I didn’t think I would be able to do, and do it well enough to be received so well by so many people. You begin the book talking about how you grew up eating “seasonal, local, and freshly made food that emphasized lentils, beans, vegetables and fresh fruit” and mostly vegetarian, when and how did you decide to become vegan? 5 years back, I started blogging, adopted our pom and also started fostering other dogs from rescues. Food blogging and rescue work came together when I started reading vegan blogs. The connection about loving one animal dearly while eating the other was made during that time. I also found out about the cruelties in the dairy industry. The incessant exploitation of the bond of motherhood between cows and calves made my heart ache. So within a month or so, I transitioned to a vegan diet and then continued with other changes in lifestyle in the rest of the year. Can you tell us more about Indian cooking? What kinds of tastes did you grow up with in the area you grew up, versus how foods are prepared in other parts of India? India has many regions and states which have their own cuisine, which might be similar or very different. My family is North Indian, so we ate a lot of North Indian food that included many kinds of dals (legumes), veggie sides using abundant local vegetables, creamy sauces that used both the salty and sweet profiles. Southern Indian cuisine uses more coconut, curry leaves, tang (tamarind), and heat (black pepper, dried chilies, etc). Some of the western regions add more sweet profile to their dals and veggie sides. Eastern cuisine is influenced by the nearby coast and the easy availability of fish, as well as the mountains (Himalayas) influenced by Chinese cuisine. I was surprised that in the Mango Curry recipe, there was no curry powder. Then I browsed through the rest of the book and noticed you don’t use it at all — is curry powder not used in traditional Indian cooking? Curry powder is never used in India. Curry powder is a British or Western spice blend approximating the masala spice blends from north and south India. It works well as a spice blend to add to dishes, but is definitely not a traditional or authentic flavor profile. Use garam masala spice blend or the mentioned spices/blends in Indian recipes. Curry powder is generally less flavorful and has turmeric and other additions that are usually not present in traditional garam masala. What is your absolute favorite dish in the book? It’s hard to choose one. I love the Butter Sauce, Gobi Manchurian, Besan Ladoo, and Chard and peas in creamy sauce. Do you have any advice for anyone who is trying to transition to a plant-based diet? * Start with a few important/frequently used ingredients at a time. Find the substitutes available. Try all substitutes to find the ones that work for you. Sometimes some subs work in certain recipes, while some in others. It is a trial and error process. * Find vegan versions of some meals or dishes that you eat frequently. If you don’t already cook, pick up on cooking a few. * Ask food bloggers, ask in vegan forums. Ask about substitutions, about recipes, about anything. Ask about cookbooks which suit your eating style. Ask nicely and everyone will help! Find a mentor in the community who can help you through the transition. * Keep a supply of snacks or meals with you when traveling or visiting, until you can figure out how to manage travel, or how to manage visiting friends and family who are not vegan.